UKDN Waterflow > Advice > What is a Soakaway? A soakaway is a very effective way of dealing with surface water. Traditional soakaways collect all the surface water run-off into one point and then allow the water to percolate in a controlled manner into the surrounding ground/earth in the area where it falls. A soakaway drain feeds the water into the central collection point. A soakaway is a great means of keeping the ground moist and offers a water source for gardens. Often located in the rear garden around the perimeter of the property soakaways also deal with excess water during periods of heavy rain when surface water drainage systems can’t cope with the volume of water. 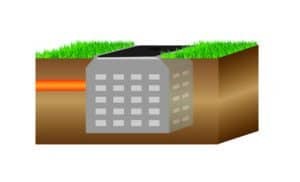 A soakaway is a hole that is dug in the ground that is filled with coarse stone and rubble that allows the water to filter through it. Some modern soakaways are created using ‘soakaway crates’ that allow the water to filter through in the same manner. 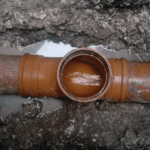 Before attempting to install a soakaway it is advisable to ensure that a percolation test is carried out to ensure that the water can soakaway quickly and effectively. High clay content is not a suitable location for a soakaway. If the ground is not suitable and you install a soakaway then water logging occurs and can contribute to localised flooding, so it is important to do your homework before attempting to install a soakaway. A 3D illustration of a soakaway. How do you maintain a Soakaway? It is important that the vegetation around the soakaway is maintained so that roots do not penetrate the soakaway looking for water sources. If roots become a problem they reduce the effectively of the soakaway. Regular visual inspections of the area should take place annually. If you spot signs of water logging or ponding then the soakaway will not be working effectively and may need desilting and cleaning. If you are unsure of how to clean and desilt a soakaway please do get in touch. It is not advisable to tackle a soakaway constructed using ‘soakaway crates’ with shovels and picks as these can crack and damage the plastic crates. UKDN Waterflow will often tackle the silt build up around the soakaway using jetvac equipment that vacuums the silt debris away leaving the soakaway functioning more effectively.